I�m going to Madagascar! As creative director of publications at the Wildlife Conservation Society for the past 13 years, I have gathered and used photos from around the world in our publications�photos are the visual voice of the Wildlife Conservation Society. WCS scientists send me digital pictures from our international conservation sites to represent their stories in our magazine, Wildlife Conservation, and to use in reports, brochures, and on our website. Through their eyes, I have learned about the beautiful and remote places where they work and why conserving them is a global priority. Now, I am going to one of these remarkable places�Madagascar, the world�s fourth largest island, off the east coast of Africa. While I�m there, I will be taking digital photos with the Nikon SLR D70 camera, of the many spectacular species and places that WCS is dedicated to helping protect. Madagascar is a 20-hour plane ride away from New York. I am part of a small group from the Wildlife Conservation Society, including WCS president Dr. Steven E. Sanderson, Africa Program Director Dr. James Deutsch, and members of the WCS Board of Trustees. Our plan is to visit WCS conservation field sites and other national parks in Madagascar. My role is photographer�to document everything�the trip, the wildlife, the wild places, and WCS at work. In addition, WCS is building a new exhibit at the Bronx Zoo��Madagascar�- set to open in 2006. I hope to take digital photos of everything from lichens to lemurs. The pictures will be used for promotion of the WCS Madagascar program and as reference during the building of this new exhibit. Dr. Helen Crowley, WCS Madagascar Country Director, has set up an extraordinary 10-day trip that will take us around the country�from tropical lowland forest in the north to the dry, spiny desert in the south. We arrive late into the night. 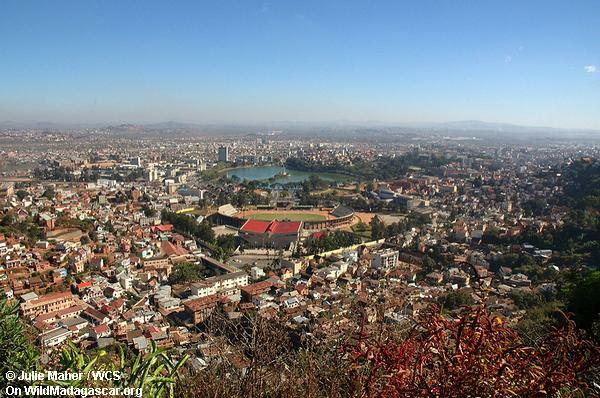 Antananarivo or �Tana�, the capital of Madagascar, is quiet at this hour. It�s midnight. The police stop our van, in fact all vehicles, as we move through the city. It is a routine security check. The weather is cool, as Tana is in the center of the country and on a high plateau. Tana comes alive in the day. A city of about 2 million, there is activity everywhere, and as much traffic as New York�but NO stop signs and much gridlock caused by zebu cattle carts, a form of transportation more prevalent than cars. From the top of the town, the city expands in every direction, an urban scene that then transitions to rice fields and rural settings at its edges. WCS has its base office here, staffed by people who direct and organize WCS conservation efforts throughout the country�both inland and coastal. To understand Madagascar and our work here, I start with the people of Madagascar, the Malagasy, and their culture. Mananjo Jonahson, a WCS shark biologist, spends the day showing me her city. There is a picture everywhere I look. Malagasy handicraft and flower markets are filled with color, texture, and style. 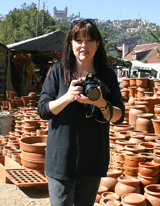 Clay pots, hand woven baskets, and fragrant flowers surround us. The children at the markets and on the streets particularly like having their picture taken. With the picture results available instantly on the LCD of my D70 digital camera, I always had a crowd. This city is diverse. Despite its beauty, we see poverty all around. We stop at a river community�their laundry is the river itself. Their industry is �recycling� old tires for shoes and tools, and fires burn the old rubber, giving off black smoke and an acrid smell. The WCS office is in a three-story villa in the middle of Tana. I spend time finding out how broad the WCS Madagascar Country Program, which started in 1993, really is. With projects both terrestrial and coastal, the staff based here are experts at everything conservation, from biology to satellite maps to policymaking. They are developing plans and training programs to sustain the natural resources of this country. Tomorrow, we are off to field sites to see this WCS conservation program in action. Flying over northeast Madagascar, I take many aerial photos of the diverse terrain below. The trees, waterfalls, hills, and valleys create geometric shapes�both intriguing and sad. Signs of deforestation and erosion blemish the landscape. Forests have been burned to make way for agriculture. Madagascar has one of the most threatened ecosystems on earth. More than 80% of the forests and many of their unique inhabitants are now gone. WCS has been involved in establishing parks where the forests have now been protected. Makira Plateau, a new conservation site with a vast forest contiguous with Masoala National Park, are below us. 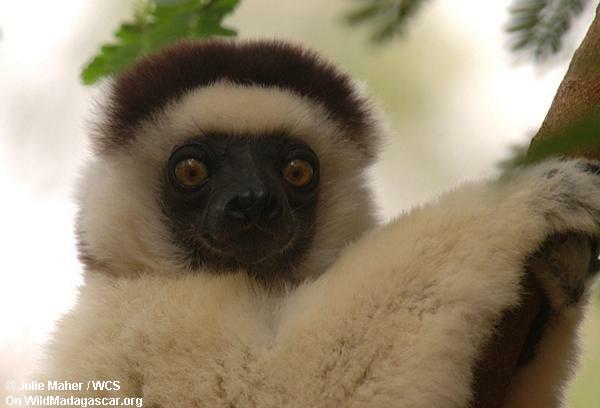 Masoala was set aside in 1996 and protects part of Madagascar's largest remaining rainforest. As we fly in over Antongil Bay, we see the humpback whales in the water�many of them�breaching and blowing in groups beneath us. We are inspired. We land in Maroansetra, the town nearest WCS field sites that are based in rainforests, on coasts, and in the waters surrounding the northeast part of Madagascar. We head for the beach. Along the way, a familiar fragrance fills the air. We pass tables of drying vanilla beans on colorful blankets. The beans are derived from an orchid plant brought here from Mexico. Vanilla is a major export product for the eastern coast of Madagascar. We boat out to the bay where the Cetacean Research and Conservation Program, headed by Dr. Howard Rosenbaum, is on the water using digital cameras to record behavior and physical details of the humpback whales for their studies. It is breeding season. The waters are literally churning with humpback whales. 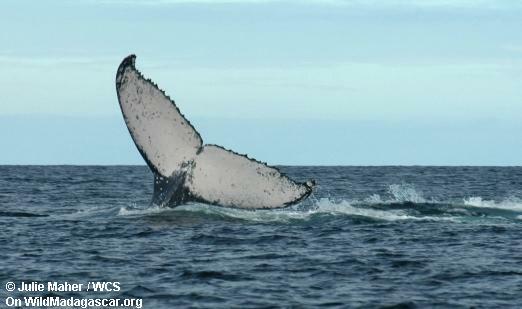 The group we follow does not breach often, but there are many tail flukes and flipper slaps�common behaviors the whales display, during this season. The whales spin and spout so close to our boat, we can hear them breathe. My friend, Pete Ersts, a research scientist, who has been involved with this project for the last four years, prepared me for this trip, but not the difficulty in getting great shots of these leviathans. Taking pictures from a small, rocking boat in a large life vest with a long lens is an acquired skill. I am glad for the 70-200mm vibration reduction Nikkor lens. And, I have a new appreciation for Pete�s photography skills, which are represented in the CRCP digital database of over 60,000 images of whales and other cetaceans. This takes practice! We head on to Nosy Mangabe, a small island that is a national park, where the CRCP has its base camp. Our first hike is at dusk, and in this rainforest, I can hear things, but cannot see what makes these noises. Two others have fallen behind the group with me to take pictures. They are checking every leaf and branch for small animals. Dr. Herilala Randriamahazo and Dr. David Meyers, WCS biologists who have worked in this area for 20 years, are calling me over to them every few minutes. �Julie, over here, I have something for you to photograph!� We crawl all around the wet ground. The diversity is so abundant, I can barely keep up documenting their discoveries. A tiny chameleon, Brookesia, less than an inch long clings to a sliver of wood. A leaf-tailed gecko blending into a tree trunk keeps an eye on us at all times. Small frogs are among the leaf litter. There are unusual insects shaped and colored exactly like their chosen perch, undetectable at first to me, but obvious to the experts. The Nikkor 105mm AF lens is great for capturing this forest fauna up close. It begins to rain. More life in the rainforest abounds. I have taken over 50 pictures already, and we are planning a late night hike. Our headlamps and the beam from my flashlight illuminate our subjects enough to meter and take each picture. A problem arises in some cases though. The chameleons we find, normally colorful by day, are nearly all white at night. I remember Dr. Tim Davenport, my friend and a WCS field biologist in Tanzania, telling me about this color change as a reason why his team censuses chameleons at night. They are easy to spot, yes, but impossible to photograph. We are in search of the elusive and nocturnal aye-aye, an odd-looking lemur that lives only in these forests of Madagascar. The trail is steep�covered with slick and twisting roots and rocks�and wild African hogs have rutted out trenches seeking tubers, their favorite food. We lose track of the aye-aye search group. Herilala, Dave and I are off the trail. It begins to rain, and I see two glowing ruby eyes among the leaves � is it an aye-aye? No, it�s a moth! The lens has not stopped fogging over, and auto focus isn�t working. It�s been all manual settings on my camera for the last few hours. We pack my camera gear in bags of silica overnight to dry out my equipment and give it life. Back in my tent at 1 a.m., everything is wet. I have my laptop on my stomach (the only dry place) downloading images from flash cards. I have been shooting NEF files and have to clean the cards every night to reuse them the next day. Finding power to charge my laptop has become my bane. The battery gives out, and it rains all night. The rain continues. I spend the day inside the whale research station, a small wooden structure on the beach of Antongil Bay. It serves as a mini-lab for the whale team, complete with computers and a tiny kitchen, where Malagasy rice is the food staple. The team doesn�t go out to study whales in this weather. They, instead, process their digital images taken the day before, and record and compare data for each whale in each picture. Norbert Andrianarivelo, a WCS marine biologist, works on the tools used for collecting genetic samples of skin from the whales. Yvette Razafindrakoto, also a WCS marine biologist, fine-tunes her equipment that records the songs of the humpback whales in the bay. A song of the humpback whale can last up to an hour and could be a form of communication during mating. The exact role of the song in whale mating is still unknown. Yvette�s recordings will be compared on the computer, like the digital pictures, to further study these complex songs sung only by the male whales. We leave Nosy Mangabe by boat to visit Masoala, which wears a giant cloud at its peak like a stylish hat. A WCS project since 1996, Masoala National Park is the largest protected area in Madagascar and is one of its most important regions for conserving biodiversity. Dr. James MacKinnon and other WCS biologists have established ecological monitoring systems for WCS in this primary rainforest. The park is the home of many more treasures including ten species of lemurs. We hope to catch a glimpse of the rare red-ruffed lemur, a primate that lives high in the forest canopy. It�s a straight up climb, and Herilala and I are last, as we ford small streams with waterfalls spilling over our feet. We have to stop for the photo ops. The chirps of frogs and calls of parrots fill the air, but we are listening and looking up for the red-ruffed lemur in the tree tops. We hear loud calls � back and forth above us. Our guide takes off in a particular direction. Helen and I pick a vantage point. It begins to rain, and I am thinking about how to keep the digital camera dry. Helen intuitively frees a rainforest �umbrella�, a banana plant with a 6-foot long leaf, from the surrounding flora, and pulls it over us. It is a perfect shelter with a perfect view of the forest. The guide comes back � he�s found a lemur group. We retrace our steps and peer into the canopy. There it is! The red-ruffed lemur, three stories up, resting on a branch! I have the 70-200mm VR lens on my camera. I point vertically and get the shot. We are back on the boats to Tampolo, a marine park where WCS works to save the habitat that includes sea turtles and other marine life. It is a paradise � azure waters with black rocks just exposed. I am imagining colorful fish and life below the surface. But no time to explore this trip, the waters are looking ominous, and we have a two hour boat ride back to Maroansetra, across the bay. We are leaving the rainforest and humidity for the dry and desertlike southern part of the country. The transitional forests climb up the hillsides, dotted with Triangular palms (Neodypsis decaryi), that thrive nowhere else this planet. We travel past villages with their wares displayed for sale at roadside stands. Dave and I stop for photo ops of panoramic mountain views and local monuments. Dave uses his Coolpix 8700 to get the panorama shot. Rice remains the main agricultural crop, and signs of its production are all along the road, from the small sprouts in the fields to the harvest in a basket atop a woman�s head. We quickly hike another national park, Andohahela, This park is filled with plantlife that has adapted to these semi-arid conditions. The trail is lined with baobab trees, weaver bird nests clinging to their limbs. Sisal plantations, bearing plants whose sharp-tipped leaves yield a durable fiber when harvested, dominate the flat terrain. Much of the woodlands have been cut down to allow for miles and miles of this major export product of southern Madagascar. The sun sets, and the red dust from the dry, dirt road settles on our skin. We arrive at Berenty Reserve. Our night hike in this gallery forest isn�t as filled with finds as the rainforests, but it�s not as wet either, and the digital cameras are working fine. There are lemurs, chameleons, and a gecko who just lost his tail to a bite in a battle. At 6 a.m., light leaks over the fog-ladden forest. Each picture in my Nikon D70�s LCD has a painterly quality at this time of day. The sun begins to burn brightly, and we see the lemurs change places. The diurnal dwellers, like the brown lemur, come filing out of the trees and filling our path, one after the other, their tails at attention. Ring-tailed lemurs sit sunning and sifakas dance by in the red dust. Dave and I catch a couple of sleepy lepilemurs, cradled in a bough high above. It is their night, so we hurry with the 70-200mm VR lens using each other as a tripod, before they doze off. Native to the southern portion of the island, rare radiated tortoises live among the lemurs in the dry, brushy bushes Berenty Reserve has set aside for them. Nearby, the Madagascar periwinkle, a flowering plant used in a drug that increases the survival rate in children with leukemia, blooms brilliant pink. We board our plane and head north and east. We touch down at Isalo set in rock mountains that protect it like stone sentinels. An iguana basks by my camera bag. We set down on the west coast of Madagascar on a landing strip that doubles as a cow pasture. Cars are waiting to take us on ride to Tsingy de Bemahara National Park, where limestone massifs run along the river. The drive before dark is quintessential Madagascar � incredible ambient light warms the massive baobab trees that line the road. Of the eight species of baobab in the world, six are endemic to Madagascar. Our driver points out chameleons in trees branches that brush our car. We have to forge a river to get to our bungalows. It is completely dark, and I don�t tell the others, but Dave is using his headlamp to check for Nile crocodiles that might be crossing the river with us. Pirogues (hand-chiseled canoes) cut through the remote river lined with limestone cliffs, tsingys, that jut above us on both sides. Tsingy de Bemahara National Park was not a tourist trek until 1998, and local lore is timeless here. In a hushed and serious tone, our guide advises us of a taboo or fady, a belief related to an action that could have consequences. In this area, it is NO pointing. We must keep our hands closed when gesturing. We all fall victim to the taboo within minutes. Our fingers fly up as we spot the ancestral bones directly above us. Helen and I have to sit on our hands to keep them still. In the afternoon, we climb the tsingys themselves. It is tough terrain, with sharp edges and tight passages. We barely scrape through the cracks and crevasses on the �easy� trail. My backpack gets stuck so I carry the camera gear around my neck. I have lenses on two cameras, the 18-70mm and 70-200mm, in case we spot the highly endangered Madagascar fish eagle, which nests in this land. And we do, but it is too far for these lenses. The shot here is the vista itself. The return flight to Tana affords amazing aerial views of the tsingys below. They are evident for many miles. It took us hours to scale the smallest section of them, and I�m wondering if the tsingys have been completely explored in this remote place. Back in Tana, I get my first warm shower in a week. East of Tana is Andasibe-Mantadia National Park, home of the largest living lemur, the Indri, a giant black and white �teddy bear� primate that feeds voraciously on leaves as it leaps along the canopy. This diurnal lemur makes loud morning calls that can be heard a mile away. It is still morning when we arrive, and I am listening for these calls. I stay with Herilala. He is familiar with this montane forest from fieldwork earlier in his career as a biologist. He knows how and where to look. Soon, he pulls me to him. We have an Indri feeding up above us! 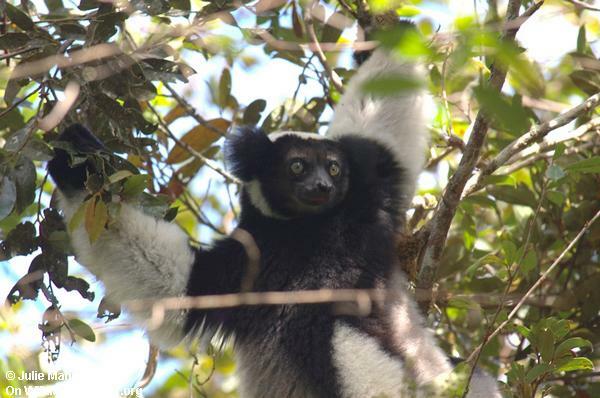 A long-legged lemur, the Indri bounds between branches, not particularly picky about the leaves it eats, just so there are many of them. Most of the world's remaining Indri live in this park. Their numbers are few due to habitat loss and hunting. I have the 70-200mm VR lens with a 1.5 converter attached to the D70. After a fifteen minute straight up photo op, the indri outdistances us in seconds, performing 30 foot vaults at the top of the trees.